My family loves slow cooker meals. For me, they seem to be the perfect type of meals that marry wholesome home cooking with quick and easy. 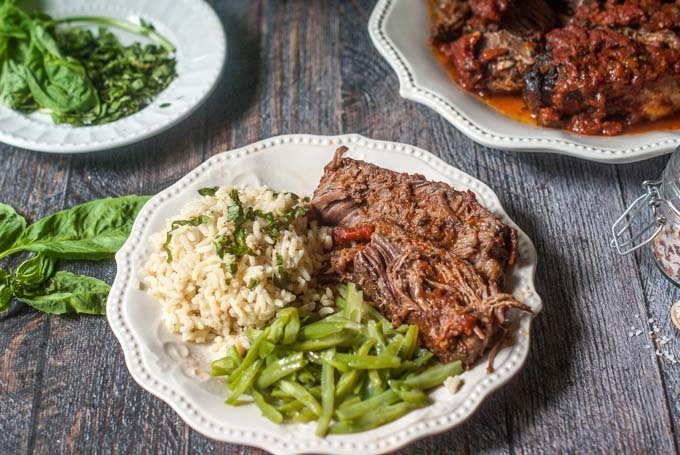 I just made this slow cooker marinara pot roast for my son, along with two of his favorite side dishes and it only took me 20 minutes for the whole meal. This meal also worked out great because I’m having guests stay with us for 2 weeks. I wanted to have a good meal for my guests and not spend all night in the kitchen. Tonight I used French cut green beans and Uncle Ben’s® Flavor Infusions Garlic & Butter rice. I thought they would go great with this Italian pot roast. Growing up we ate ALOT of rice and Uncle Ben’s® has been my family’s preferred brand of rice. My mother and grandmother always used it and now I do too because it comes out perfect every time. It’s never sticky or mushy, just perfect little grains. I love this pot roast because it takes very little prep. I just cut the garlic into slivers and stuff into the roast. Then I slather some Italian seasonings and salt on the outside of the roast. Do this the night before and pop it into the slow cooker the next morning along with jar or canned marinara sauce. That’s it. Just 5 ingredients and a few minutes. When dinner time comes around, the roast is done and all you need to do is make your side dishes like these green beans and rice. A wholesome delicious dinner in less than 20 minutes. Here’s a meal prep tip for you. Marinate or prepare a few slow cooker roasts and store in your freezer. Thaw overnight and make sure you have a few easy to prepare side dishes like frozen veggies or these Uncle Ben’s® Flavor Infusions on hand. I buy the meat in bulk when it’s on sale and prepare a few different recipes with them. If you want to dress up your side dishes you can add jarred pesto to the veggies or maybe nuts and flavored olive oil. All things you probably have in your pantry. Now you have a few go to meals on hand any day of the week. Here’s how you get 2 meals from 1. Another nice thing about this meal is that it makes great leftovers. Even if you don’t want to eat it exactly as it is the next day, you can transform it from a pot roast dinner as seen below into …. … a pot roast sub and refreshing rice salad for lunch. 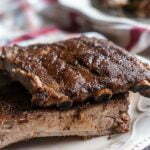 My hubby ate this for dinner the next night and loved it! 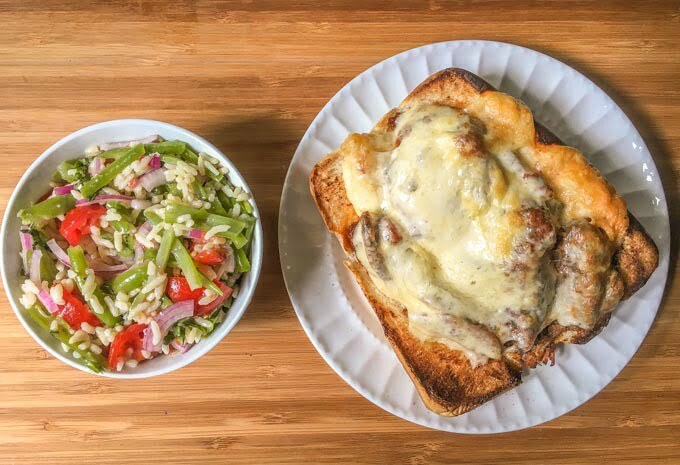 The sub tastes better than any meatball sub you’ve had and the rice salad is so easy to make. Just add some grape tomatoes to the green beans and rice, along with red onion, basil and Italian dressing. It’s a delicious dish on it’s own. 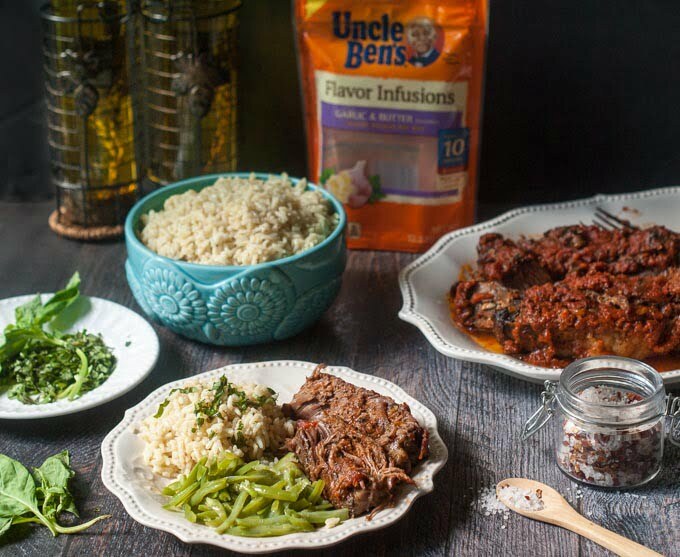 By the way, one of the reasons I came up with this meal is because I noticed these new Uncle Ben’s® Flavor Infusions at Walmart. 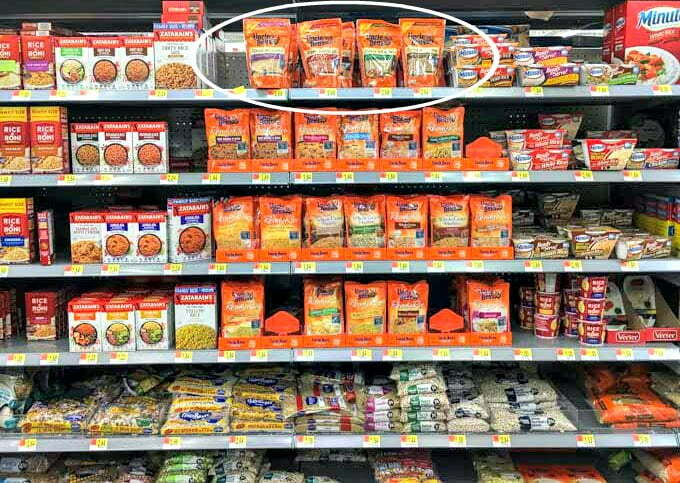 I went to Walmart specifically looking for side dishes to go with the frozen roasts I had for my guests. These rice side dishes are nice because they come in a resealable bag and contain 8 servings so you can get more than one meal out of them. Also they don’t need a messy flavor packet because the grains are infused with flavor. 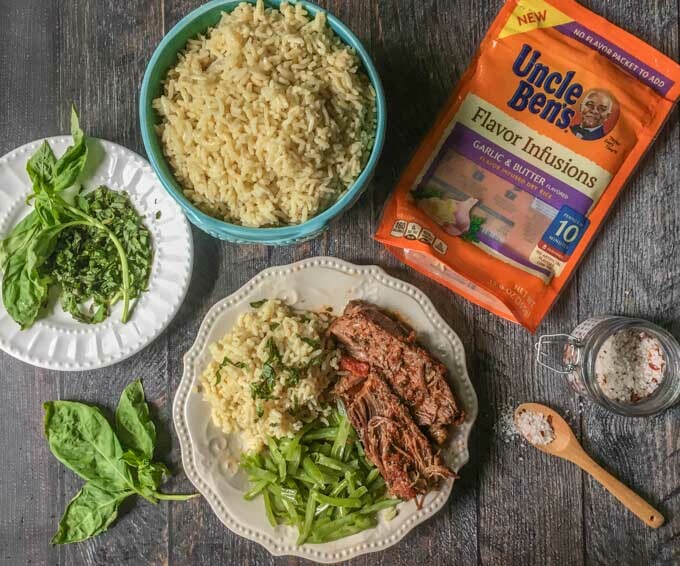 To learn more about Uncle Ben’s® Flavor Infusions or just to get some great recipes check them out here or check them out on social media (Facebook, Pinterest, Twitter or YouTube). My mom and grandma would have loved these! Well I hope you like this quick and easy dinner. It was a big hit with my family. 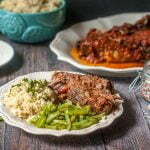 And with just a little planning you can cook your family a delicious and hearty dinner any night of the week. 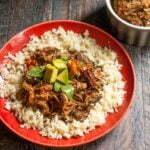 Some more great slow cooker recipes to try! It looks like that beef will just melt in your mouth! I love cooking meat in the slow cooker or instant pot because I tend to dry it out if I cook differently. You know that is absolutely true about the Instant Pot. It’s so tender. Thanks for stopping by Marci! Your pot roast looks amazing!!! 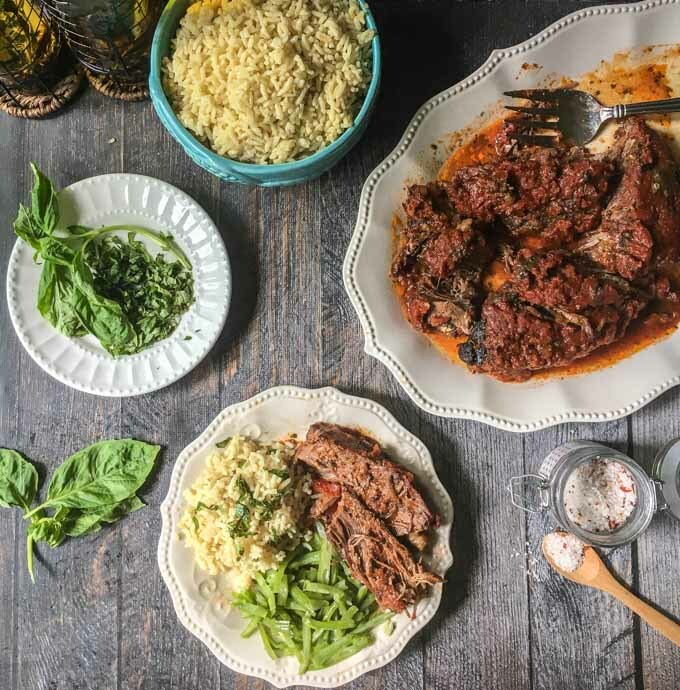 Pot roast is my go-to recipe for my slow cooker, but I never thought to spice it up a bit with the marinara! And I hadn’t seen the flavor infused Uncle Ben’s before. I’ll check it out! The pot roast was really good and we will be eating it again soon! Those Flavor Infusions are really good Pam. It’s nice it comes in a re-closable bag so you can get many meals out of them. Looks so good, thanks for sharing! I pinned it to my slow cooker board. Thanks for stopping by Brooke and for pinning! Yum! I never would have thought of cooking a roast with marinara sauce. 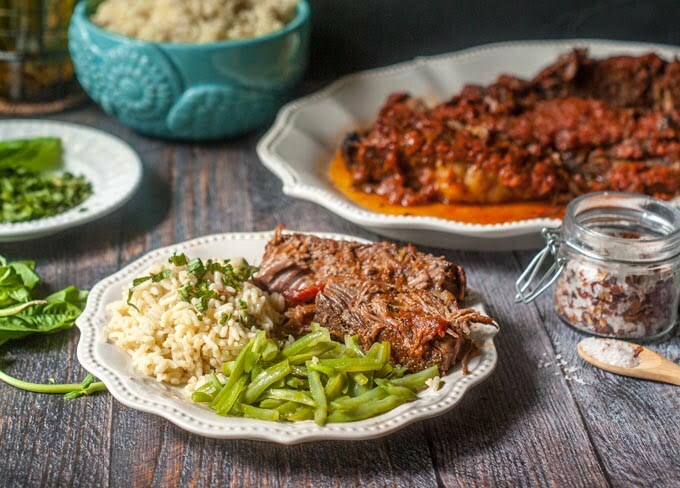 I love getting new slow cooker recipes, and this one looks like a keeper. I’ve been using Uncle Ben’s products ever since I got married. Their long grain and wild rice is still the best of all the brands, I think. I haven’t seen these flavor infusion products; I’ll look for them! I love a good Pot Roast recipe because I tend to over cook it. So this will come handy next time I make pot roast. Uncle Ben’s is my favorite rice to use, I am a big rice person to the point everyone in my family says Rice again! We are big rice eaters too. Luckily my family really likes it as much as I do! 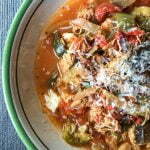 I love using my slow cooker during the warm months. So much easier. I love that this recipe only has 5 ingredients, and the rice is a perfect accompaniment. I agree about the slow cooker Stacey. No one wants to spend time in a hot kitchen in the summer time. 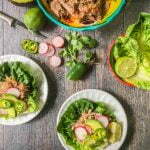 The rice is perfect for this dish and as I mentioned to another reader, the Spanish flavor was really good with any type of Mexican or Tex Mex meal.